Remakes, remakes, remakes... 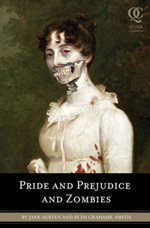 Seems to be the new Hollywood horror vogue at the moment, probably thanks to the success of the actually really rather brilliant Dawn of the Dead. Well, following hot on the heels of the recent The Hills Have Eyes, we've not got long to go now until the next 'classic horror' big-budget make-over with The Omen, set for release on the 6th June 2006 (or 6.6.06 if you prefer your gimmicky dates). Yep, this remake of the 1976 horror classic stars Liev Schreiber, Julia Stiles, Mia Fallow, David Thewlis and Peter Postlethwaite, and to celebrate the release of the film (that's 6.6.06 remember! ), Fox have kindly given us five prize packs, each containing a cap, a T-Shirt and dog tags to give away. To stand even the remotest chance of winning, you'll have to answer the question below, enter your email address and then just calmly sit back and wait for a time when we have a spare moment to draw the winners (around end of May). Unfortunately, this competition is, as ever, only open to residents of the UK. 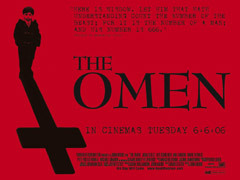 Fear the date – 6/6/06 – when THE OMEN opens in theaters nationwide. A remake of the 1976 horror classic, the new film takes the tale of the coming of the "Antichrist" – personified as a young boy named Damien – to an even more thrilling and visceral level. Who lost his head in the original Omen?